Outwell Flagstaff 5 Person Deluxe Tent is a 3-room pleasant structure full of features, with tinted PVC windows, with a fully sealed floor and a huge waterproof and windproof rating, fully enclosed and suitable for a cold weather camping. Outwell Flagstaff 5 Person Deluxe Tent. When you see the pictures the first thought would be that this is a tunnel tent. But note that the side poles are almost straight and close to vertical, this is due to pre-bent segments which you have at the roof. So the side walls are straightened and tall. On the other hand, the front wall under the porch is completely flat and totally vertical. This all is typical for a cabin style tent. I would say this is a great tunnel-cabin combination. The tent is not freestanding so plan your camping spot, it is heavy and must be staked properly. This is a 3-room structure, and you have an inner tent within the shell with two sleeping units, plus a large living room. This inner tent is pre-attached and this makes pitching quick and simple, but you can remove it if you need the shell alone, for example for some family events in the garden. Note that the divider between the sleeping units is with zippers and you can roll it up when not needed and fix on the ceiling by toggles. Here you have a feature they call a universal inner; one part of the inner tent can be removed (unzipped) completely. The floor plan and some of the dimensions. They call those sleeping rooms Ambassador master bedrooms and this is clearly because of their length which is 250 cm and at the moment of writing this text there is no other tent here in the site with longer rooms; though the Vermont XLP Premium 7 from the same brand is with the same design. But the truth is that these rooms are still rather narrow as you realize from the picture above. So the tent is a hybrid single-double layer type; the sleeping zone is a double layer and the rest is a single layer shell. Space-wise, the declared capacity is 5 people. But see what this tent offers: you have 155.4 ft² (14.44 m²) of the fully protected space, plus 33.4 ft² (3.1 m²) under the porch. This means 31 ft² (2.9 m²) per person (plus the porch area), quite a luxury obviously. Note that the living room area is fully sealed and you have 7.44 m² here, so 5 more people can easily fit in if needed. All in all, this tent’s capacity is far bigger than what they declare, and this is quite the opposite of many other tents on the market. But if you think this is a lot of space, check their Edmonds 5A tent, it offers far more. Some more dimensions to understand the comfort which this tent offers. Seasons-wise, this is a tent with a huge waterproof rating (more below) and with a wind resistance level 10 on the Beaufort scale. This is among the maximum you can have for a tent and they have improved it from the level 9 in the previous version. This puts it in the same group as the Vermont XLP Premium 7 tent from the same brand. The tent is with what they call the Wind Stabilizer System, you will see it in the video but see also the picture below, this includes some Velcro tabs that you wrap around the steel poles. If you are not familiar with this terminology, this level 10 implies winds of up to 89 – 102 km/h (55 – 63 mph). For comparison, hurricane winds are level 12, ≥ 118 km/h (≥ 73 mph). So this is a tent for a 3-plus season camping. Climate-wise, this is related to the previous paragraph. The tent is fully enclosed, with PVC windows and sewn-in and sealed floor, so it is very suitable for a cold weather camping and I have included it in my list of cold weather tents. Regarding the weight and the packed size, this is a tent for car camping. It is very heavy and bulky, see more in the specifications below. The poles are a combination of steel (4 arches) with 19 mm diameter, and fiberglass (one loop at the end of the tent) which is 12.7 mm in diameter. The steel poles are pre-angled for extra headroom. Note that the poles are partially shock-corded, so the roof segments and the vertical poles are separate and each of them are with multiple shock-corded tubes. Here in the video, you will see how to pitch the tent; note that this is the previous version which has 2 fiberglass poles; the new tent has only one, all others are steel. Also, the porch which you see here is smaller, but you will see the new version in the other video below. The shell is what they call Outtex 5000 and this is 100% polyester Oxford taffeta with taped seams and the waterproof rating of 5000 mm. The inner tent is a breathable 100% polyester. The floor is a double-coated 100% polyethylene with 10000 mm hydrostatic head. All materials are fire-retardant. Note that the ceiling is with a thermo-reflective coating for a cooler atmosphere, and the inner is with a darker material, so this is a type of a dark-rest tent. There are two entry doors, both are double-layer type so you have waterproof layers and mesh to use separately as suits you best. The inner doors also have the double layer structure in their upper portion, for ventilation purposes. The main front door is with a design that makes the bottom entry area completely flat, so that kids do not kick it when they run around, and to have an access with a wheelchair if needed. All 5 separate windows (plus 2 on the doors) are solid with tinted PVC material so you have reduced glare. In addition, you have inner shutters with toggles for privacy and to reduce the daylight. With such a fully enclosed design, vents are essential. So you have them here above the windows and one large vent is on the back, see the picture below. Note here that the new 2018 version has a much larger back vent which goes all the width of the tent. All vents are with Velcro stiffeners and mesh, and on the long rear vent, you also have zippers to close completely when you feel cold. The doors are also with mesh, and the front door is so deep under the porch that you can keep it with mesh only even when it is raining, so a good cross flow is always there. 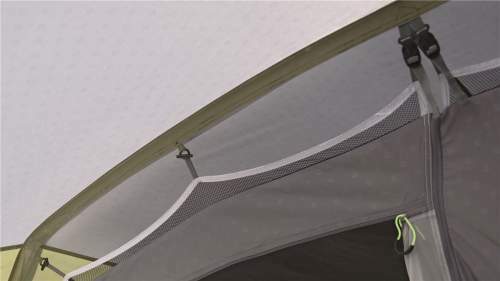 The inner doors are also with mesh in their upper sections, and on the rear side of the inner tent, you have a mesh section that pairs the long back vent. The inner tent is well separated from the shell, see the picture below, so you have a good air circulation everywhere around. This is good to fight condensation, see the picture below. So in view of all this, ventilation should not be a big issue in this tent. This is the back vent, very long, zippered, and with several Velcro stiffeners. 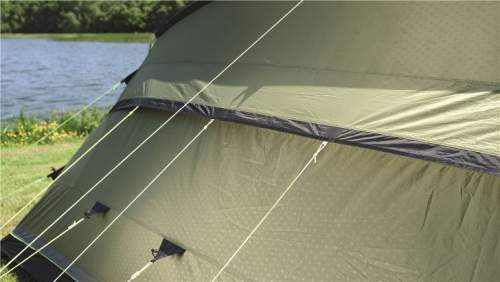 The inner tent is attached to the shell – the large gap is for ventilation. Guylines retainers – those are Velcro tabs to keep the guylines nicely packed. You have three types of color-coded pegs for an easy setup, they are shown in the video above. There is a huge organizer unit between the two inner doors, from the ceiling to the floor, with 10 large pockets for storage. Mesh pockets in the inner tent for small items. 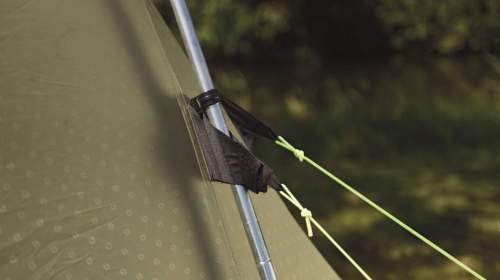 Cable entry points are available on the shell and on the inner tent, all with zippers. Lantern holder and cable tidies. Weight: 58.4 lb (26.5 kg). Dimensions: 205 x 122 in (520 x 310 cm). Inner area: 155.4 ft² (14.44 m²). 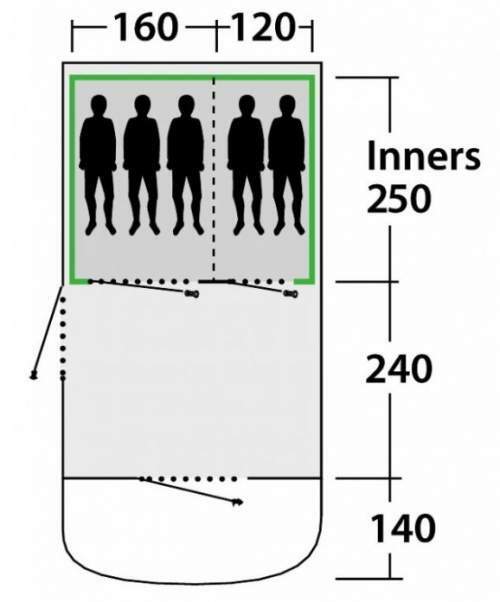 Inner area per person: 31 ft² (2.9 m²). Porch area: 33.4 ft² (3.1 m²). – Flysheet: 32.7 x 11.8 in (83 x 35 cm). – Poles: 27.6 x 5.9 in (70 x 15 cm). In the table below I give a few tents side by side with this Flagstaff 5 tent, this might help in making an informed choice and also you have more affordable options if this tent is too expensive. I give only a few basic data so please follow the links to read more. There are big differences in the technology, you realize that the Vango tent is with air beams. All of them are with a huge waterproof rating and they are built in the same style. 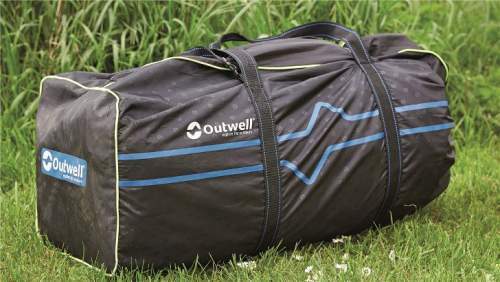 In the summary of this Outwell Flagstaff 5 Person Deluxe Tent review, I would say that there are no many tents that would match what you have here. This tent is able to withstand a lot from what nature can throw on it. The wind and rain resistance ratings are simply impressive, strong materials are used in its construction, so this is a tent built to last. It offers lots of space, but you might want to check also their another 5-person tent, the Edmonds 5A which is even bigger but with air beams instead of poles. If you need more options, just look in various categories here in the site, all possible sizes and types are presented in detail. Do you have any experience with this tent? If so, please share your experience, there is a comment box below. I wish you a nice day. Have you tried putting the awning on this tent? Had real difficulties Last summer. Hi Christina, not sure what kind of problem you had. If you speak about the front awning, it has its own pole which is added just like the other poles. The only thing that comes to mind is that perhaps the poles were mixed. Cannot say more without more details. outwell.com specifies this tent as OWS 9, so outwell.com claims it resists wind force 9. Are you sure it can resist wind force 10 scale ? Hi Ilya, thank you for the comment. This is a bit of a confusion on the Outwell’s side. Yes you are right, they write this is for the wind force 9 in the description of this tent. But at the same time, in their video (given above) they give an info that the version for 2018 is for the wind force 10. You will see it in the left upper corner.